Fresh lemons are washed, sliced covered in salt for 24 hours, then drained and mixed with spices to cook in Tajines. Making Msir is easy and adds a unique flavor to meals but careful, just a small amount of the North African pickled lemon seasoning goes a long way. Cut four slits on equal sides into the lemons, but do not slice all the way through. 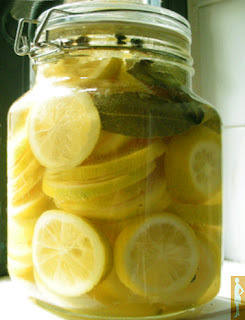 Pack the sea salt into the lemon segments and pack the lemons as tightly as possible into a quart size mason jar. Fill with water and seal jar properly. African food did you know?